Perhaps no one can define terms such as innocence and guilt to the satisfaction of all, but a magistrate exonerates or condemns with a single word. This problem forms only the tip of the proverbial iceberg. But without language, problematic though it is, we could not in any meaningful way do so much as communicate. And without communication, we could scarcely conceive of ourselves as individuals, let alone ones characterized by love or hate or hope for the future. In his collection We Don’t Know We Don’t Know, Nick Lantz worries words like beads on a string. If language has the power either to pave the way to salvation or to usher us down the road to hell, then we must use it with care and respect. Reports that say that something hasn’t happened are always interesting to me, because as we know, there are known knowns; there are things we know we know. We also know there are known unknowns; that is to say we know there are some things we do not know. But there are also unknown unknowns—the ones we don’t know we don’t know. We might at first mistake Rumsfeld’s meaning for something simple phrased in a difficult way: the idea that we cannot be sure that something has not happened when we have merely not observed anything happening. But the lack of an observed phenomenon does not equal the existence of an unobserved one. The former falls squarely in the land of logic; the latter, in the land of something else, perhaps faith. Rumsfeld has conjured something from what may be nothing, and this sleight of hand helped to mobilize an army. The epigraph from Pliny the Elder appears to illustrate the old conundrum of translation: how to reproduce the writing of another without using any of the original words. Philemon Holland’s solution involves more or less rewriting Pliny, imposing his own sense of literary decorum and poetry, and Pliny thereby enters a fantastic dimension, with animals that “knoweth” the world by a “secret instinct” and man who “knoweth nothing unlesse he be taught”—like the empty shell of a golem waiting to receive paper instruction. But we must consider that, as a translator, Holland presents his own words, which are far from Pliny’s, as Pliny’s own. Can we say that Pliny remains if only a small fraction of him does? No, Holland has cast him out, erased him, and in Pliny’s place sits a changeling, someone whom the actual Pliny would very likely have trouble recognizing. first time your fingers grazed the inside of your wife’s thigh? on my face in the morning? Will you ask him how he can remember anything? Will you say, I know, we watch you day and night? Will he ask, How could you sit by and do nothing? Will you say, We thought you were praying? 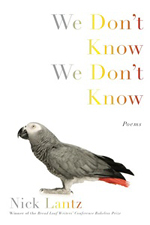 In another poem, “As You Know,” almost every sentence starts with the phrase “As you know,” as though readers should have intimacy with all that follows, although what actually follows is a series of obscure facts: “As you know, dogs were also convicted / of witchcraft and burned at the stake. / So were chickens, fish, and a few trees”; “As you know, during the Cat Festival in Ypres, / effigies of cats are thrown from a belfry tower”; “As you know, the word gift in German / means poison.” And the repetition of the introductory phrase reveals in all of the violence a weariness and a sad folly. through cracks in the earth. the sunlight stippling your face in the early morning? you must spit on it. go and feel his feet. And the story of the “you” and his mother grows similarly desperate and senseless, concluding with his being afraid even to answer the telephone, lest he hear the diagnosis that he dreads. But even more than the death of the body, an abstract kind of death haunts the collection, the kind of death that produces a changeling like Philemon Holland’s Pliny the Elder. In “What We Know of Death by Drowning,” Lantz considers several individuals who underwent that particular death long before their bodies ceased to function. These include Josef Mengele, who changed his name and fled to South America when threatened with trial for Nazi war crimes; Natalie Wood, whose parents changed her name from Natalia Nikolaevna Zakharenko as a first step in making her a marketable Hollywood star; and Bennie Wint, who faked his own drowning and lived under a different name in order to escape a drug ring. Each of these individuals had to die a symbolic death in order to make a better future available. But as we asked about Pliny the Elder, to what extent is the person prior to the symbolic death the same as the person after it? “The eye inscribes its pattern on the mind,” Lantz writes in “The order that Bees keepe in their worke,” and a name, too, serves as a kind of eye through which a person sees the world. Certainly, Josef Mengele’s later years would not only have been very different without a symbolic death, they would not have existed because the tribunal would have ordered his execution. But the changeling born of a symbolic death lacks the freedom to be wholly new, free of a past and all that it contained. The changeling is doomed to live in the shadow of its predecessor, to answer for that life. the fangs of ice from the eaves of our lover’s house? Questioning is the fundament of Lantz’s collection—indeed, he devotes an entire poem to “A History of the Question Mark.” And for Lantz, the question is both the method through which we come to know and a kind of passion. To question, to experiment and to go against the grain, to shed light upon what we did not know: these delight and thrill, because to learn is delightful and thrilling, like creating something new, although occasionally that creation turns out ugly. And even at its most distressing, the book entertains with the vigor of a virtuoso conversationalist and storyteller recounting the strange things of the world, from the behavior of a “starving bear” turning “over the same boulder again / and again, expecting each time / to find something to eat” to the conceptual affinity between Leonardo da Vinci’s unfinished painting, Adoration of the Magi, and Bruce Lee’s unfinished last film, Game of Death. We may never be able to laugh at horrors, but we find consolation in putting them into words. Lantz reminds us how much we need those words today and always, how we need them this very minute. Nick Lantz is the author of two recent collections of poetry: We Don't Know We Don’t Know (Graywolf Press, 2010), which won the 2011 GLCA New Writers Award for poetry, the 2010 Posner Book-Length Poetry Award, and the 2009 Bakeless Poetry Prize; and The Lightning That Strikes the Neighbors’ House (University of Wisconsin Press, 2010), which won the 2010 Felix Pollak Prize in Poetry. He is currently a visiting assistant professor of English at Franklin & Marshall College. Six poems by Lantz appear in this issue of Blackbird.